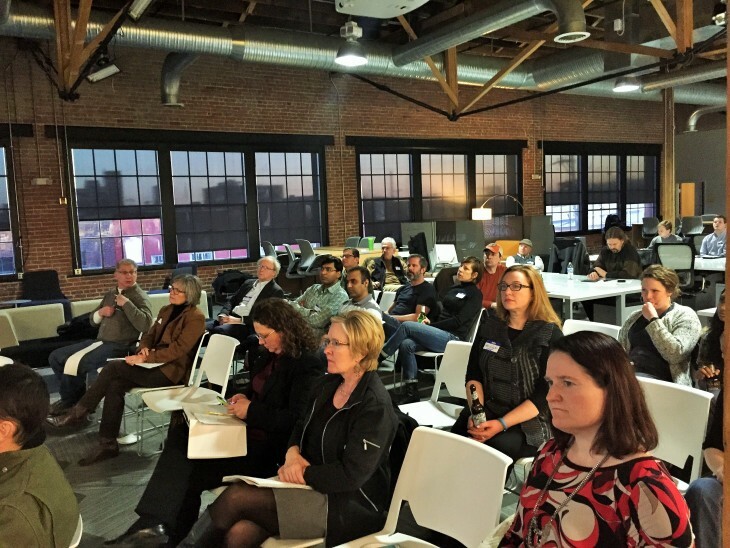 Dr. Marjorie Skubic presented at the third Digital Health Innovation Forum by KC Digital Drive, Feb. 23 at Sprint Accelerator. KC Digital Drive’s third Digital Health Innovation Forum continued on the journey to highlight Kansas City health projects that utilize high-speed fiber-optic Internet. 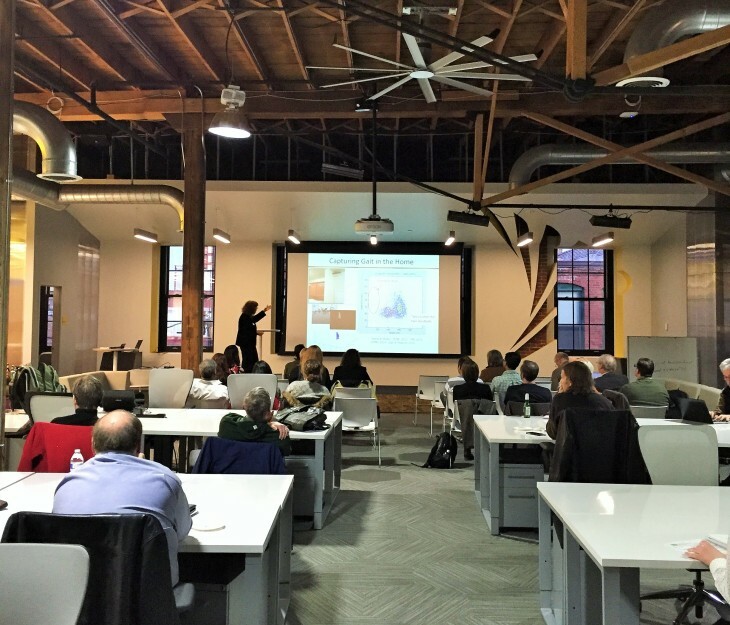 The Feb. 26 Forum at the Sprint Accelerator, “Reaching Into the Home,” addressed the themes of innovation, connectivity and consumer-engaged health care for individuals in their homes. A crowd of around 40 people in the digital health space, including practitioners and professionnal service providers, was in attendance. 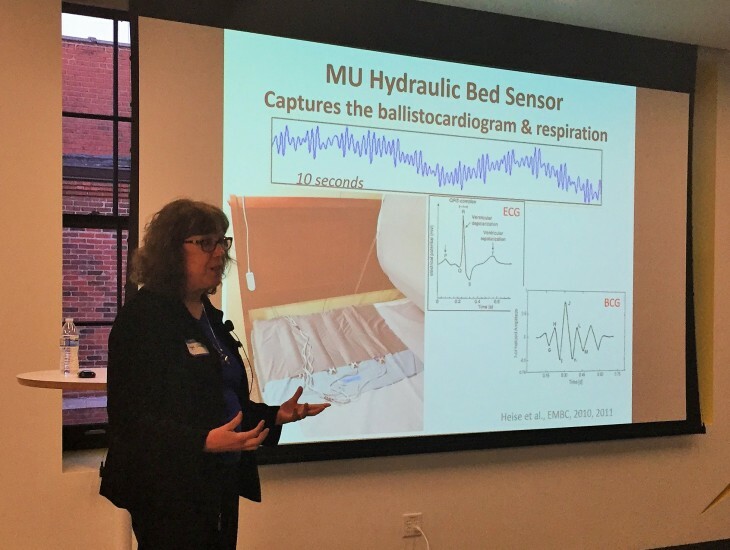 Featured speaker Marjorie Skubic, PhD, director of The Center for Eldercare and Rehabilitation Technology (CERT) at the University of Missouri, introduced her project that monitors older adults through a network of sensors placed in their home. The project is supported by a National Science Foundation/US Ignite Early-concept Grant for Exploratory Research (EAGER). The Center’s team includes an interdisciplinary group of faculty, staff and students who are focused on investigating, developing and evaluating technology to serve the needs of older adults and others with physical and cognitive challenges. The group represents electrical and computer engineering, computer science, nursing, medicine, social work, physical therapy and health informatics. This in-home system allows health care professionals to monitor daily routines of the individuals from data and video collected by strategically-placed sensors. The devices range from simple motion sensors, video sensors and bed sensors. The sensors capture situations health care providers would like to prevent, such as falls, or captures unusual gait patterns that could lead to falls. They also monitor pulse and respiration levels. Dr. Skubic showed schematics for a sensor/camera array that allowed seniors to age at home. “We now see how people are falling,” Skubic said. By analyzing the reasons people fall, health care providers on the team can then develop interventions to prevent falls in the future. The system works in real-time with phone alerts for emergency situations. Skubic said this all contributes to an improved quality of life for the individual. The technology collects a lot of data and takes a lot of video, Skubic said. They’ve had some networking problems in the past due to the amount of data that is transmitted. The CERT project was expanded to Kansas City because of the access to high-speed broadband. “Having a higher bandwidth certainly makes it easier,” she said. In keeping with KC Digital Drive’s goal to connect health care providers and entrepreneurs, Greg Corpier and Katie Boyer with Telecare Global presented their innovative strategy for use of in-home technology to help individuals such as those participating in Skubik’s project. Their solution uses technology to create devices that change according to a person’s needs, Corpier said. This fusion of technology allows them and health care providers to improve the quality of life for their customers and patients. Corpier and his team at Telecare Global analyze the data received by sensors, such as the ones used by Skubic’s team, and track patterns to create home design systems that help people. Their philosophy is that technology can be used as an assistant. An example of their solution is the creation of a voice-activated system that allows cabinets to be raised or lowered making kitchen items easier to reach. They also design touch or voice controlled faucets and adjustable sinks among other items. Innovation doesn’t stop with Skubic and other businesses. Repeating what the Center has done on a larger scale is a goal of Skubic’s. One way to do that is to collaborate with other organizations, academia, students and businesses, such as Telecare Global. Another organization, the I-70 Corridor Network on Aging, was also created with this goal in mind. Those involved facilitate interdisciplinary research and teaching on topics related to aging, which includes an annual conference. The next conference is set for Nov. 5-6, 2015, in Kansas City. For more information, visit the website www.i70aging.net. The Digital Heath Innovations Forums are sponsored by REACH Healthcare Foundation, Kansas City Area Lifesciences Institute, Inc., and Sprint Accelerator powered by Techstars.